Have you been wanting more games on your BlackBerry PlayBook but having trouble finding something to keep you busy? How about a little Brick Breakout? 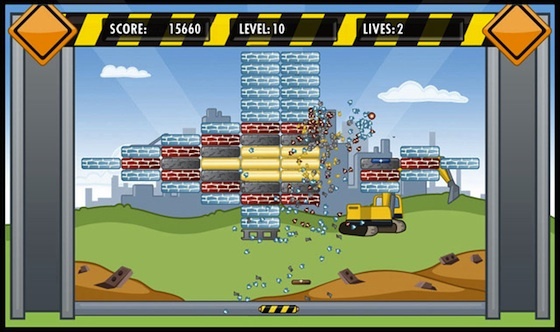 From Smarter Apps (makers of Angry Farm), this twist on the classic BrickBreaker puts you in a construction site where you break through wooden beams, classic bricks, pipes and concrete slabs. Unleash the devastating power of hidden power-ups which transform your paddle into one of many efficient tools to become the ultimate brick breaker! Seek out the power of multi ball madness, super balls that tear a path of destruction, the rapid fire of the nail gun, the super extended paddle, or sticky paddle for controlled strikes to break your targets into splinters. Also hidden beneath the debris, you'll find extra lives, score multipliers to earn points faster, and the most devastating force yet in your arsenal. With 33 levels, power-ups and free upgrades, Brick Breakout it sure to keep you entertained for quite a while. While we can't have everyone's favorite BlackBerry game on the PlayBook, Brick Breakout really does the trick. Brick Breakout is available now in BlackBerry App World for $2.99 (If you don't see it now keep checking back - it's just rolling out and should show up for everyone soon).